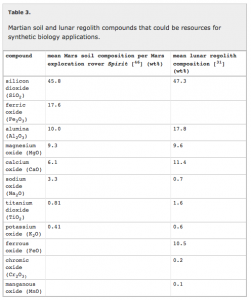 Thus I am both a bit ashamed (because I had not thought deeply about it) and excited to see this news story in GIGAOM: Heading to Mars? 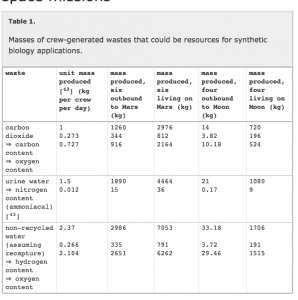 Think about packing microbes before food and building supplies bu Signe Brewster and the open access paper behind it: Towards synthetic biological approaches to resource utilization on space missions by Amor A. Menezes, John Cumbers, John A. Hogan and Adam P. Arkin. This paper is a long long read but so far it is fascinating. Figure 1. 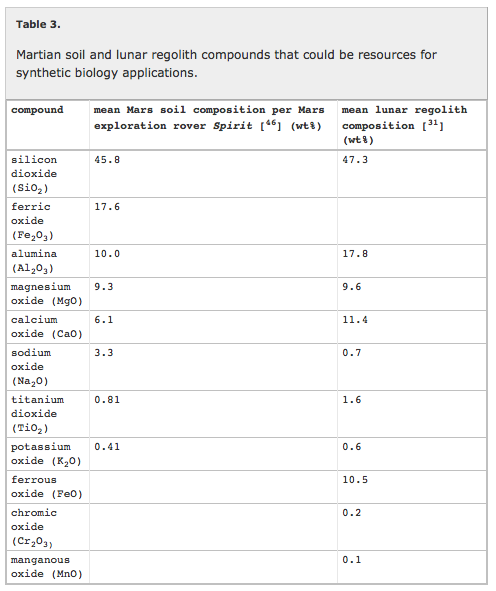 Projected Moon and Mars missions have the greatest destination residence times, thereby necessitating in situ resource utilization when at the destination on these missions to reduce costs and risk. 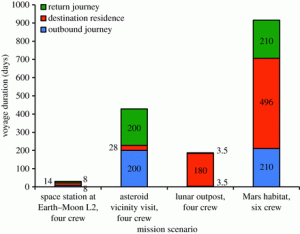 The Mars mission also has the longest journey times, comparable to that of the asteroid visit mission; thus, effective resource utilization during Mars mission travel is also necessary, with any analysis applicable also to the asteroid mission. 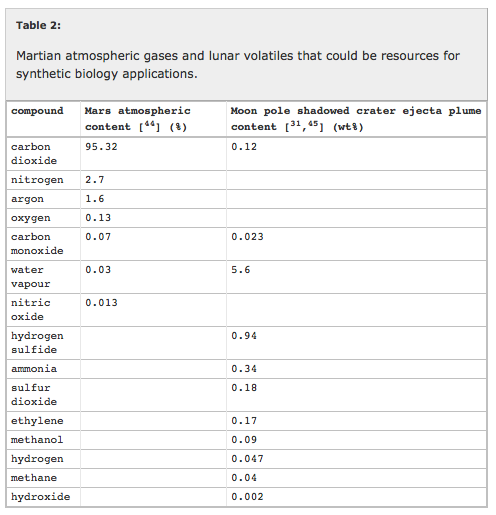 They go through in lots of detail some of the various issues with solving some of the challenges outlined in these tables and the figure. And they conclude that synthetic approaches, such as those involving microorganisms (and also 3D printing) can possible help solve many of these issues. Synechococcus sp. PCC7002 using the complementation of a cyanobacterial recA null mutation with the E. coli recA gene on a plasmid expression system. Synechocystis sp. PCC 6803 with the 4ABH and nhoA genes. 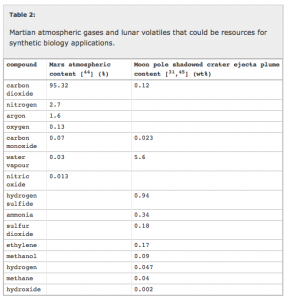 It will take me a while to go through all of this in detail but this is a fascinating article that changes my perspective on “space” and “microbes”. 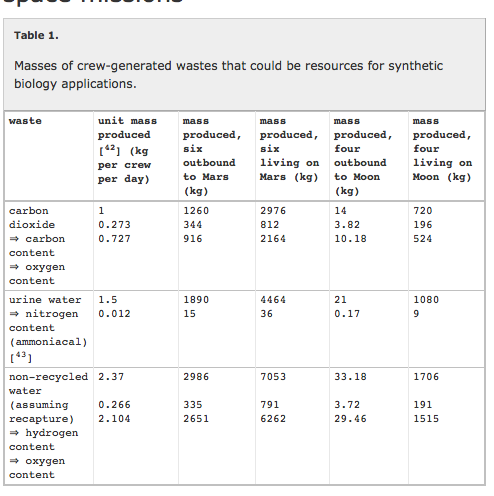 Personally, I do not know much about this area of using microbes as a tool in space travel but at least from my point of view, this paper appears to be pretty groundbreaking and visionary. And it is worth a look. @phylogenomics Thanks for sharing this–just glancing through it is totally fascinating. I agree- something I had never thought about! That’s just awesome. We’ve been focusing all this time on keeping microbes OUT of space when we should have been finding a way to use them IN space. It’s amazing how much cargo they’d be saving! Go microbes!